While this post may mainly be about the Arby's Beef 'n Cheddar sandwich, it's also a bit of a personal retrospective on my experiences with Arby's over the years. Back in the 80's was the first time I remember having Arby's. There was a stand alone Arby's at the mall, not a food court full of teenagers, but just an Arby's right there with the rest of the stores which made it a nice little unique stop at the mall. As a kid back then it was always an Arby's Jr. for me. 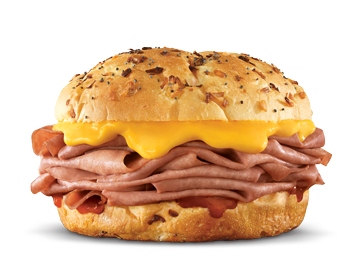 As the years when on, I upgraded to the regular Arby's, which was just the bigger version of the Jr. Later on as I became more open to try new things, the Arby's cheddar melt and even the swiss melt were great options to change things up now and then. Finally, the number one choice to grab became the Arby's Beef 'n Cheddar. It was an upgrade from a cheddar melt at the time in that it came on an onion roll and was a bit bigger. This became the regular choice for years to come when hitting Arby's, until 1 fateful day a few years ago. I remember the day well, we chose to eat at Arby's that day and of course I got the usual Beef 'n Cheddar meal. As I sat and took the first bite, something was terribly wrong. The taste was totally different, I didn't know what the hell was going on, but after closer inspection I noticed that Arby's messed up and put some sort of sauce on it. After pointing this out to a cashier, I was informed that that's how they make them now. WHAT? Now for years, Arby's had a selection of "Arby's sauce" and "Horsey sauce" (still don't know what the hell horsey sauce is) readily available at the table, but I always steered clear because no sauces were needed. Now they've taken the best sandwich there and added some weird sauce that changes everything? I think just now all these years later is the first time I've taken the time to actually look up what they added to the Beef 'n Cheddar, and it's described as a "zesty Red Ranch sauce" on the Arby's website. I just don't get it, it was great before, and if anyone wanted sauce they could have added it themselves. Because of this, my choices have varied when I go to Arby's. Don't get me wrong, I don't HATE the modern Beef 'n Cheddar and I'll still have one here or there especially since Arby's has a lot of great coupons that make for a real deal, but because of the sauce it's not the ultimate "go to" sandwich it once was. Are you a Beef 'n Cheddar fan? If so, from what era? How do you see it....sauce or no sauce??? I like the Big Montana, a loaded baked potato, and a peanut butter cup Concrete. Oh wait- they don't have any of that stuff anymore, either. They probably don't have 39 cent Shake of the Months either. I use to get the ham egg and cheese croisant and potato cakes for breakfast too, but they dont serve breakfast where I live now.